Are you thinking about buying a kayak to enjoy a little water fun? If so, you should know that there are many different types of kayaks on the market today, each slightly different from the next and each designed for different purposes. To help you make the best purchasing choice for your particular needs and preferences, below we will highlight a number of different types of kayaks, and explain the design features and purpose associated with each type. If you enjoy outdoor activities and water sports, having a kayak is a great way to enjoy both. Kayaks can be enjoyed in a number of environments, including rivers, lakes, oceans, white water rapids and more; and where you intend to use your kayak will play a big role in the type of kayak you should ultimately purchase. What many shoppers don’t understand is that kayaks are designed for specific uses. Knowing the types of kayaks that are best suited for specific types of water and/or activities will help assist you in purchasing/using the best one for your intended adventures. Today, the kayak market has become extremely varied, and there are currently an abundance of options for outdoor enthusiasts. In the sections that follow, we will list and briefly describe the various types of kayaks on the market today, helping you make the most educated purchasing decision when you are ready to take the plunge (so to speak) and invest in a high quality kayak. The creek boat kayak could best be described as the standard or traditional type of kayak, the type that has been around longer than the rest. This type of kayak is perfect for both the novice, intermediate and advanced kayaker. The creek boat kayak is designed to make fast and agile turns, making it perfect when boating on rivers and creeks, although because of its all-around sturdy design it can actually be used in almost any water environment. A creek boat kayak is a “high volume” kayak, with an equal amount of space around the cockpit of the boat. Its design makes it much less likely to submerge, and even it does briefly submerge it will resurface almost immediately. Creek boat kayaks have slightly rounded bows. They are equipped with edges along the bottom of the boat that make it easier for paddlers to negotiate tight turns. A very versatile kayak to say the least, the mid-size creek boat should be your kayak of choice when you intend to use it in many different types of water environments. Made more for the advanced kayaker who is into intense water sports, the play boat or play kayak is the shortest of the kayaks on this list. These boats are designed exclusively for surfing waves, holes and performing tricks, but they are not made for river, creek or lake paddling. The play kayak is shaped somewhat like a banana—a complex and intricate shape that helps it perform well when used in high-performance water sports and competitions. They are designed with a squashed deck, which enable paddlers to perform tricks in the boat when surfing the high water. The center or cockpit of the play boat boasts a lot of space. This extra volume helps to guarantee stability while using the kayak in situations where it is vertical, such as surfing waves. If you are into high performance water sports, or you are simply looking for a kayak in which to perform tricks and surf the waves, the play kayak is definitely the vessel for you. But again, for normal paddling and the like, you might want to steer clear of this boat in favor of the creek boat instead. If you are an intermediate to advanced kayaker, and you are looking for a boat with the paddling ability of the creek boat and the high performance of the play kayak, the downriver kayak may be the vessel for you. The downriver kayak is exceedingly versatile, with an ideal combination of stability and agility. This boat falls right on the middle line between high volume and low volume. The result for paddlers is a kayak that offers a controlled cruise down a river, creek or stream, with some added play features for performing a wide variety of tricks. The downriver kayak has a pointed bow or tip. This unique design feature allows the boat to shed water as you paddle, resulting in a comfortable ride with plenty of control. Of all the kayaks on this list, the downriver kayak is definitely one of the longest. This lengthy setup enables it to move smoothly along the water and helps paddlers maintain a straighter and more controlled course. So what type of water environment is the downriver kayak most suited for? Actually, it is suited well for several types of water. 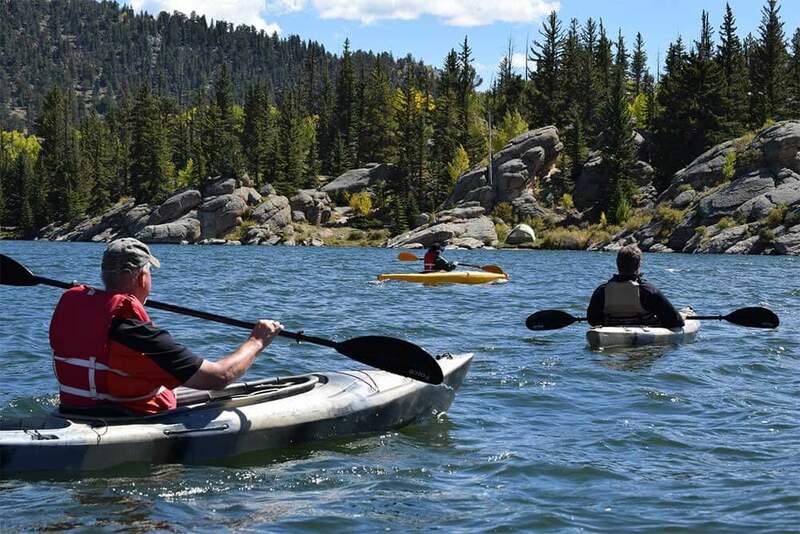 The downriver kayak is perfect for those looking to cruise down large lakes and reservoirs; it is ideal in calmer, straighter rivers; and does well in the bay. It is not particularly well-suited for ocean or white water kayaking. Although ideal for intermediate kayakers, the downriver boat is also well-suited for beginners just starting out (although not as perfect as the creek kayak). Novice kayakers that are planning to boat across large lakes will find that this vessel travels at a faster and more controlled rate than other kayak types. However, due to its length it takes some getting used to when using this boat in river situations with tight turns. Advanced kayakers who are looking for speed and control, along with a boat that is designed to perform some basic tricks, will find the downriver kayak right up their alley. Next we come to the Sit-On-Top Kayaks. Just as the name implies, the Sit-On-Top Kayak is a boat with no cockpit whatsoever. Instead, the boats are designed in such a way that the paddler sits on a well-shaped plastic seat near the middle of the vessel, and stretches their legs out in front of them on top of the kayak. As you can see, with this type of kayak the paddler is very exposed to the sun and water. Because of this, these (mostly) recreational kayaks are ideal for those who want to laze around on their boat and catch some rays in the process. Intended mostly for beginners, the Sit-On-Top Kayak is very easy to use and maneuver. As such, it is one of the most commonly used kayak types on our list, second only to the creek boat kayak. When getting a rental kayak from a marina, you are most likely to receive a Sit-On-Top Kayak, mostly due to their affordability and easy maneuverability. Just like the creek boat, they are immensely quick, easy to learn and quick to control. If you plan to kayak on a lake or some other stable water source, the Sit-On-Top Kayak is a very good choice. The boat is perfect for simply cruising on a lake, for sightseeing expeditions, and even fishing. However, if you intend to try your hand at surf kayaking, white water paddling, or navigating some other type of advanced and difficult water environment, you should definitely skip this boat. Inflatable kayaks are those that, well, inflate. These kayaks are widely available and they do offer some advantages, such as easy portability and being the perfect kayak with which to travel. They are ideal for compact storage and transport, and the only choice for people without a vehicle to transport another type of kayak. Given these advantages, you may be thinking that this is the perfect boat for you. However, before you make that choice, keep in mind that inflatable kayaks are only intended for recreational use. They are not a type of kayak that can negotiate streams or fast water, and should only be used on very stable lakes and reservoirs. Inflatable kayaks can be difficult to maneuver, but they are very stable, making them great for novice boaters who want to experiment with the sport before spending more on a plastic or fiberglass kayak. They are also great for family boating outings, as many inflatable kayaks are designed to support 2-3 people or more once properly inflated. Although white water kayaks and ocean kayaks share many similarities, they are far from being the same. Moreover, they CANNOT be used interchangeably in the two environments, meaning white water kayaks should stick to the white water, and the ocean kayaks belong only in the sea. Simply put, white water kayaks and ocean kayaks are fundamentally different, with the main difference being that the white water kayak is designed primarily for maneuverability, while the ocean kayak is designed exclusively for stability—keeping it stable as it rolls over surf and tides. A white water kayak has rounded hulls to assist in rolling water. This assures that the boat has a more stable contact with the water below. These kayaks are also slightly shorter in length than the ocean kayak, with minimal chines. These design specifics are added exclusively to ensure that the paddler has less contact with the water, making it much easier to maneuver the boat and negotiate angry and aggressive rapids and fast moving water. On the flip side, the ocean kayak is designed with the opposite purpose in mind: to have more contact with the water to ensure the stability of the boat. Ocean kayaks have flat hulls that help enhance the stability when negotiating ocean waves. This makes it more difficult for the water to unbalance the craft. Their sturdy and lengthy chines help the boat move faster through the water than a white water kayak, allowing the paddler to gain more distance with every stroke of the paddle. If you’re ready to buy your first kayak, then check out our guide to beginner kayaks.